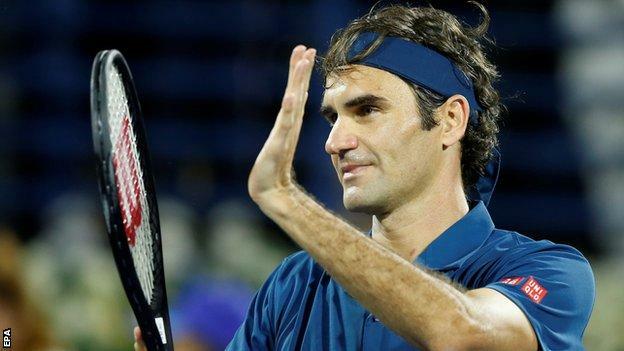 Roger Federer is one win away from a 100th ATP singles title after a semi-final victory over Borna Coric at the Dubai Duty Free Tennis Championships. Federer, 37, showed his best form of the tournament in easing to a 6-2 6-2 win over the 22-year-old Croat. He now faces Greece's Stefanos Tsitsipas, who beat Federer in the Australian Open last 16 in January. A win will make Federer the second male player to win 100 singles titles after American Jimmy Connors, who won 109. "Tsitsipas is tough to play, tough to beat," said Federer. "He showed me that at the Australian Open, how hard he is. Maybe the final is a little bit of a revenge match. "Reaching 100 titles - we're still far from it. I'm just going to try to focus and play good tennis,"
Tsitsipas recovered from a set and 3-1 down to get past Frenchman Gael Monfils 4-6 7-6(4) 7-6(4), a win which will propel the 20-year-old into the world's top 10 for the first time in his career. "The whole match changed out of nowhere," Tsitsipas said. "I've improved since last year. Beating the big guys, big players, players that have been in the top 10, it means a lot."